At the invitation of State Councilor and Foreign Minister Wang Yi, Abul Hassan Mahmud Ali, Foreign Minister of the People's Republic of Bangladesh, will visit China from June 28 to 30. Q: Could you offer us more details on the Bangladeshi Foreign Minister's visit to China? Does China have any expectation for it? A: China and Bangladesh are friendly neighbors. In October 2016, President Xi Jinping paid a visit of milestone significance to Bangladesh during which the China-Bangladesh relationship was elevated to a strategic cooperative partnership. Through Foreign Minister Abul Hassan Mahmud Ali's visit, the two sides will strive to achieve greater synergy, further implement the outcomes of President Xi's visit to Bangladesh and move forward the all-around cooperation. State Councilor and Foreign Minister Wang Yi will hold talks with Foreign Minister Abul Hassan Mahmud Ali, and they will exchange in-depth views on China-Bangladesh relations and issues of mutual interest. China looks forward to joining hands with Bangladesh to move forward the China-Bangladesh strategic cooperative partnership in the new era. Q: According to reports, a fire that broke out at a construction site in the city of Sejong, the ROK on June 26 has caused many Chinese casualties. Do you have more details? What has been done by the Foreign Ministry and its diplomatic missions? A: On the afternoon of June 26 local time, a fire broke out at a construction site in Sejong, the ROK. Among the Chinese casualties, one was killed and 15 injured with one sustaining severe injuries. After the accident, the Foreign Ministry and the Chinese Embassy in the Republic of Korea immediately activated the emergency response mechanism. The Embassy instantly dispatched a task force to the scene to check on and verify the situation, asking the ROK side to properly keep the body of the Chinese victim and make all-out efforts to treat the injured. While making best possible arrangements for the follow-up affairs, the ROK side should find out the cause of the accident as soon as possible. Senior officials of the Embassy also visited those injured at the hospital. As far as we know, seven people who suffered minor injuries have been discharged from the hospital. 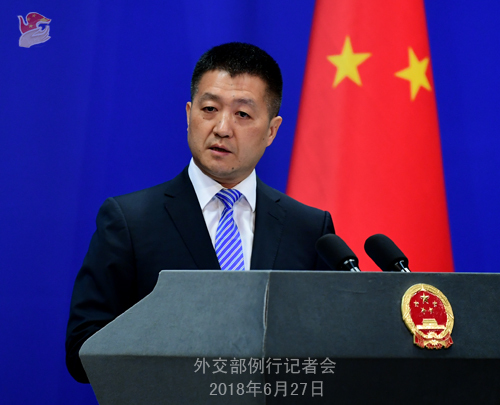 The Foreign Ministry and the Chinese Embassy in the ROK will continue to follow the development of the incident and stay in close communication with the ROK side. We will also assist the relevant families with their trips to the ROK. Q: Australia is said to pass new legislation which is meant to prevent the interference of foreign governments in Australian politics. When discussing this legislation, Australian Prime Minister Turnbull mentioned the disturbing reports on Chinese influence. Is the passing of this legislation likely to further worsen the ties between China and Australia? A: It is part of a country's domestic affairs to legislate. So, in principle, we have no comment on that. 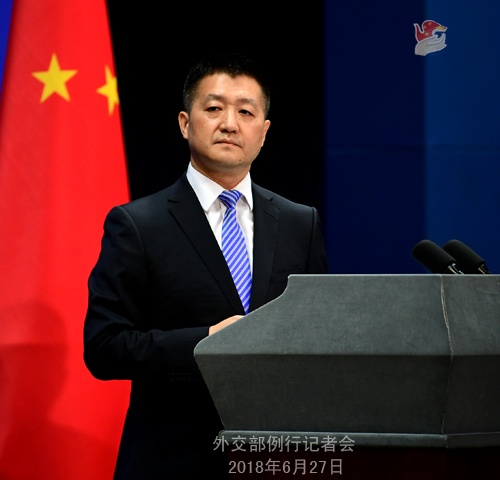 As for some people's comments trying to involve China as a factor or even making senseless speculations, I want to reiterate one fundamental and long-held principle of China's diplomacy that is non-interference in other countries' domestic affairs. That's what we have been saying and also what we have been practicing. That is also one principle we hope other countries could uphold in developing relations with others. We hope that all countries could cast off Cold War mindset and strengthen exchanges and cooperation on the basis of mutual respect and equal treatment. That would be a better way to serve the interests of all people around the world. Q: US Defense Secretary will be in China for three days. What is his schedule for today and tomorrow? What will he talk about? Will he talk about the South China Sea and the DPRK giving up nuclear weapons? A: Yesterday, I talked briefly about Defense Secretary Mattis' visit. I mentioned that it was agreed by the two sides long before. In fact, mil-to-mil exchange has always been an important component of China-US exchanges and cooperation in a wide range of areas and has already made some positive progress. You described the background of Defense Secretary Mattis' visit, including the disputes between China and the US in different fields that have attracted great media attention. Just like I said yesterday, connections between China and the US are so intricate and extensive that it is only natural to see some issues arising from this or that field during different periods. What is imperative is for the two sides to respect each other and properly deal with these issues for the benefit of the two counties and peoples. As for Defense Secretary Mattis' schedule for today and tomorrow, the Chinese leaders, including those in the military sector, will meet and hold talks with him. I suggest patience on your side for our press releases. Like you said, the DPRK issue, among others, may be brought up. Defense Secretary Mattis' visit is an opportunity for the two sides to exchange in-depth views on bilateral relations including mil-to-mil ties and other issues of mutual interest. Q: According to reports, senior officials of the US administration said that the US is asking China and other countries to cease imports of crude oil from Iran. What's your reaction to this? A: I have seen relevant reports. You can only seek clarification from the US side on whether that represents the official stance of their government. China and Iran are friendly countries to each other. We maintain normal exchanges and cooperation on the basis of conforming to our obligations under the international law, including in the fields of economy, trade and energy. This is beyond reproach. Q: According to reports, on June 26, former Japanese Prime Minister and Chairman of the Eisei Bunko Museum Morihiro Hosokawa donated 4,175 ancient Chinese books to the National Library of China. Does the Foreign Ministry have any comment on that? A: Mr. Morihiro Hosokawa has long been dedicated to the cause of China-Japan friendship, and we highly commend his generous donation of such a large collection of precious ancient Chinese books. This donation testifies to the traditional cultural bond connecting our two countries, marking a new episode in China-Japan friendly exchanges in the new era. This year marks the 40th anniversary of the signing of the Treaty of Peace and Friendship between China and Japan, and this donation is an important part of the commemoration activities for the 40th anniversary. We hope that various sectors of the two countries will continue with exchanges and cooperation of all forms to enhance mutual understanding and friendship and promote the continuous improvement and development of China-Japan relations. Q: The US Treasury is formulating measures to restrict foreign investment in its hi-tech industry. The US House of Representatives has passed a bill on tightening the rules for foreign investors in the US. Republicans believe that this could prevent the transferring of military technologies to China. Does the Foreign Ministry have any comment? A: With regard to the relevant remarks made by the senior US administration officials and the bill adopted by the US House of Representatives, we will continue to closely follow how they will affect the investment and trade relations between major economies worldwide, in particular their influence on the global macro-economy under the current circumstances. 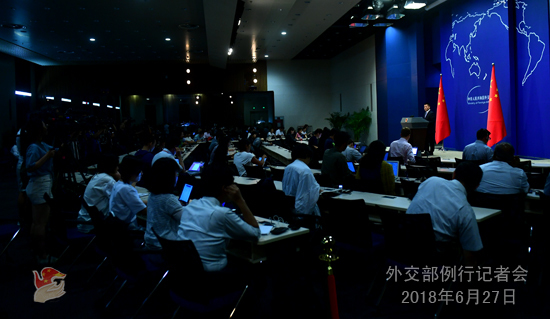 The Spokesperson of China's Commerce Ministry also stressed this morning that we will continue to follow and evaluate how these moves taken by the US side may potentially affect Chinese companies. As for those comments made by some US congressmen, our principled position is that under the current circumstances, everyone should work as a facilitator of economic and trade ties, especially between the world's major economies, and a contributor to the global trade and investment liberalization and facilitation, instead of acting to the opposite, or even deliberately and excessively interpreting normal economic and trade activities from a Cold War, zero-sum and political perspective.